I have been attempting to start an instance of EC2 in C# without luck. When passing in an instance id to start the instance I get an error that the instance cannot be found despite that I am passing in an instance ID that I have obtained from the object property. I would be most grateful for any tips or pointers with this. 3 - Add the following code (see below images). 4 - Your're done. It's very straightforward. You can check the programmatic start/stop success by refreshing your AWS Console Screen. Hope this helps those googling this and stumbling upon this question (as I did myself) start off quickly. Following these simple steps via these wizards will spare you considerable headaches. Ok, this is the FULL, end-to-end instructions. 1. Install AWSSDK.Core and AWSSDK.EC2 using Nuget Package Manager. 2. Then copy this whole class to your project. 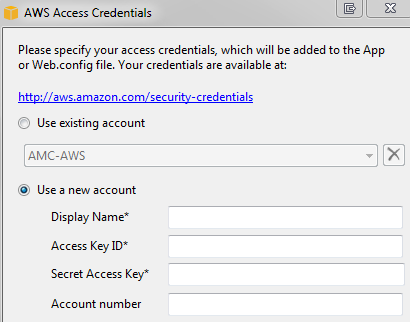 AccessKey and Secret are obtained in AWS IAM. You will need to ensure the user you create has "AmazonEC2FullAccess" (You can probably use a lower-level permission policy, I am just lazy here :D). region is your AW S EC2 instance region. and Instance ID can be found in the EC2 dashboard list. Simple, works perfectly... You can also write extra code to manage the response object. 3. Be mindful if you are behind a proxy, you will have to configure it (I havent included code here). Not the answer you're looking for? Browse other questions tagged c# .net amazon-ec2 amazon or ask your own question. Can I run 1000 AWS micro instances simultaneously? How to change AWS SDK region in code?